CES 2018: Year of the Drone? 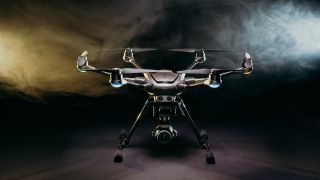 Hong Kong-based camera drone maker Yuneec took the wraps off of three new products at CES. The star of the show was the Typhoon H Plus (pictured above), an update to the Typhoon H that sports a new 1in 20MP sensor and a 23mm lens. With an ISO range of 100-6400 and shutter speed range of 4-1/8000sec, it should prove versatile in a broad range of photographic situations. It can fly for up to 25 minutes, and has a maximum speed of 13.5 metres per second. Yuneec also promises 40% less noise compared to the drone’s predecessor. The second drone is the Yuneec Firebird FPV, which is designed to simulate the experience of flying an aeroplane. That doesn’t mean photography has been forgotten, though, as it still packs a 13MP camera that can shoot 4K video, while flight time is rated to 30 minutes. Lastly, the Yuneec HD Racer is designed for knockabout indoor fun, with a 13MP camera that records 1080p video. The Typhoon H Plus and Firebird FPV will be out in the first half of 2018, costing $1,799.99 and $699.99 respectively. The HD Racer will be out later in the year, retailing at $179.99. Head to Yuneec's website for more. Looking as though it could be a potential rival to DJI’s Mavic Pro, Autel’s Evo is a folding, portable drone with a three-axis gimbal that holds a stabilised camera, one that shoots 4K video at 60p. It comes with a range of intelligent flight modes and obstacle avoidance, and can manage flights of up to 30 minutes with maximum speeds of 20 metres per second. Control is accomplished by an Android-based remote controller that boasts a 3.3inch OLED screen. It has a maximum range of 7km, and a 4300mAh Li-Po battery with a 1.3-hour recharge time. We know the drone will cost $999 (cheaper than a DJI Mavic Pro Platinum), although Autel has not provided a firm release date yet. Head to the official website for more. The booming drone business has meant that other manufacturers are starting to grab a slice of the action with drone-orientated accessories. One such product is the LaCie DJI Copilot, a portable hard drive designed specifically for drone users. At its core is a 2TB hard drive, but it also features an integrated LCD screen that allows users to see the status of processes like data transfers, as well as remaining power and capacity. It's described as a backup on-set solution (BOSS), and is designed to work with a companion Copilot BOSS app to allow users to review their drone footage on a smartphone or tablet, negating a separate laptop. The device is expected in the first half of 2018 with a US retail price of $350. Head to the official website for more. Unfortunately, the news hasn’t all been positive. Following the difficult launch and consequent lacklustre sales of its much-hyped Karma drone, GoPro has announced that it will be vacating the business, and Karma will be its first and last drone. Read our full story for more.